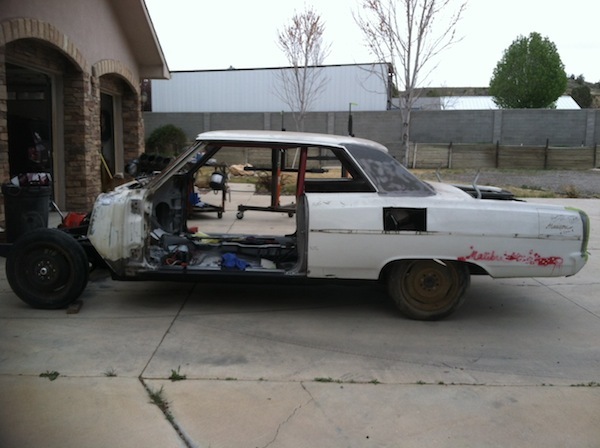 You are here: Home » Chevelle Build » April 2012 Chevelle Build Update – Body Meets Frame, Old Quarters Come Off, and New Ones Go On! 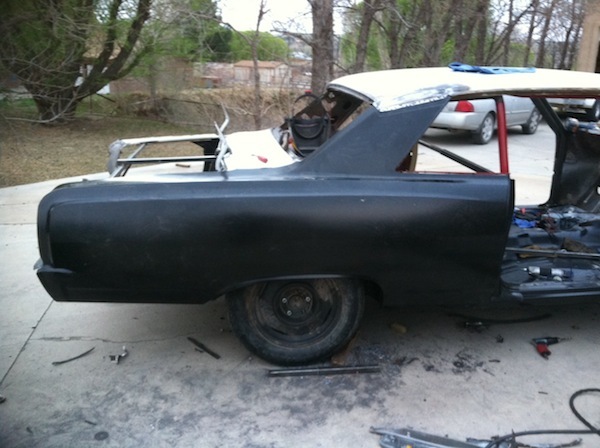 April 2012 Chevelle Build Update – Body Meets Frame, Old Quarters Come Off, and New Ones Go On! Frame, meet Body. Body, meet Frame! It seems like it’s been a year since my last Chevelle Build Update, but rest assured, a LOT has been happening over at Allison Customs, and my Chevelle is several steps closer to becoming a real car again. Since I spent the majority of the most recent update talking about the 3 cows we hit coming home from Jeff Allison’s shop, this one will be dedicated purely to the car itself. The old quarters are gone! 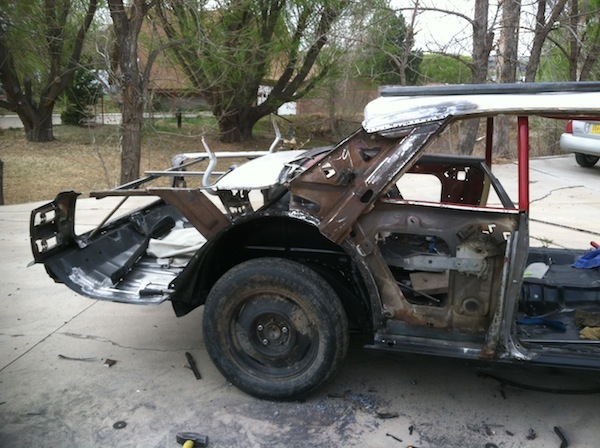 Jeff sent me this picture just after the first one showing the body back on the frame. If his intention was to stop my heart, it worked. What’s extra cool about these quarter panels is that they’re a full factory style quarter, not just a quarter skin. A factory style quarter includes the full C-pillar of the roof, the door jamb, and also includes the “top” side of the quarter that butts up next to the Dutchman panel (the panel between the rear window and the trunk lid), and connects directly into the tail light pockets. When we restored this car the first time in 1993 a factory style quarter was not available. At that time that only thing we could purchase new was the quarter skin itself. While that was a HUGE improvement over the rusted out and mangled original ones it still left several sins in the body, the biggest of which was the fact that the entire top side of the quarter panel sloped the the port side of the car (the left side tail lights actually kind of aimed down hill). The new factory style quarter will fix that right up. And just like that, the new quarters are on! Technically speaking it’s just a test fit, but it’s amazing how quickly it turns back into a real car. 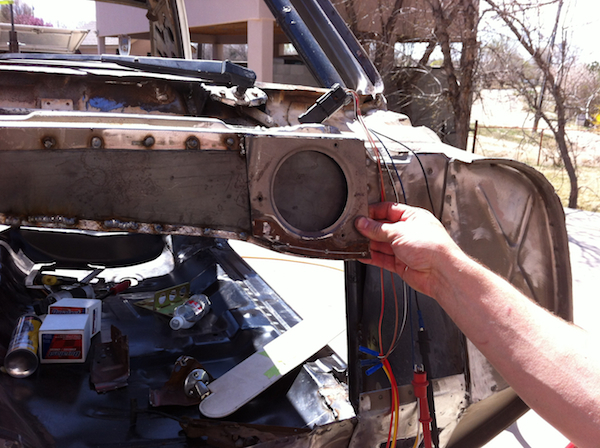 Jeff’s biggest concern during the entire restoration of this car body has been finding enough “structure” to keep the car square enough to allow him to weld in new metal. He’s finally to the point now where the car is plenty solid, though he’s left all of the bracing both in the passenger compartment and the trunk in place to complete the last big chunks of cutting. He set the body on the frame primarily to ensure that the weight of the car would be on the wheels, thus making sure that whatever flex was on the body for the quarter panel replacement would be as it should be, not masked by having the car “unsprung” by sitting up on jack stands. With the old quarter panels removed he’s now started mocking up what will be involved to put the new ones on. He’s start by finishing out the outside wheel tubs, install the quarter panels, mock up where the trunk filler panel goes (the little panel that fills the gap between the trunk floor and the bottom of the quarter panel), and then start welding it all in with factory style plug and spot welds. Easy as pie, right? The new firewall has already begun! Note the smoothed location on the upper driver’s side where the wiper motor used to go. Once the quarter panels are on it will be time to complete the firewall. Plans are to set the new LS engine back a few inches from the original mounting location to get a superior 50/50 fore-aft weight balance on the car, and the firewall will account for that. Jeff has already smoothed out several areas on it already, including removing the giant hole for the factory style wiper motor. He came up with a clever way to mount a modern style wiper model INSIDE of the cowl, so everything will be tucked together nice and neat. The wiper motor is now on the OTHER side of the cowl, and is neatly hidden. Jeff held up this original piece just for the photo. One last thing to note is that a few good friends have stepped up to continue to support the build of my car. I’d certainly like to thank my friend Dan Giustino, owner of Muscle Express in Jupiter, FL. Dan has been restoring cars for over 20 years and was kind enough to get us a few hard to find original items for the front of my Chevelle (a radiator core support and a driver’s side fender brace). Dan is also providing the weatherstripping for the project as well. Thanks, Dan! I’d also like to thank the Farrington family. Both Tom (dad) and Sam (son) Farrington have been guests on the show in the past, and the entire Farrington clan is one that I’m now proud to call friends. Tom found me passenger side fender brace for my Chevelle and was also cool enough to lop off an original frame horn from one of his ’64 Chevelle parts cars. Why a frame horn, you ask? Excellent question. 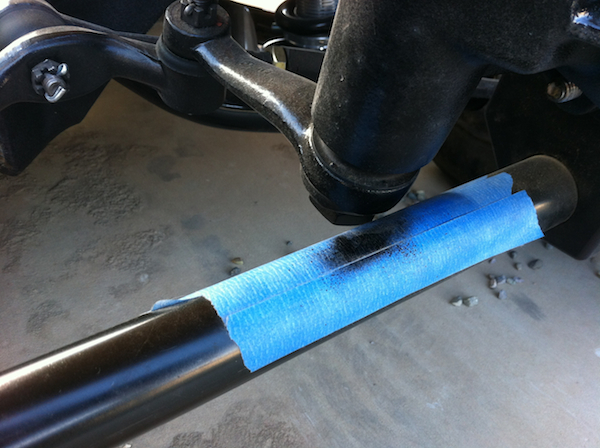 It turned out that after Jeff rebuilt the rusted out frame horns on my frame that he put the mounting spot for the sway bar pillows back where he found them…..which we have since learned was a bit off. At some previous point in the history of my frame (which is not the original anyway) both horns were repaired a time or two, and the sway bar locations were not quite right. Long story short, the Detroit Speed sway bar was hitting the pitman arm on the steering gear, and we’re pretty sure that was because the sway bar is mounted up just a little bit off plumb. Jeff is going to pull measurements from the Farrington’s frame horn and put Humpty Dumpty back together again. Thanks, Farrington’s! This photo shows the clearance issue between the sway bar and the pitman arm. Jeff shaved the pitman arm down some here and lowered the sway barm mount about a 1/4″ of an inch to get it all to fit. We’ve decided to relocate the sway bar pillow blocks to the factory location and solve the problem that way. From this point forward things are going to get interesting. We’ll need to start tackling several areas that will require a few miracles to happen to give us any chance at seeing the car on the road this year, or (my big goal) making it to SEMA in November. It’s my intent to cash flow the entire build of this car and complete it debt free. To date it’s been possible thanks to wonderful sponsor support and a few other big things lining up, but the reality is that the next several items on the docket are all fairly pricy (interior, paint/body, wheels, all electrics, trim, etc.). I’m confident that God will continue to provide the right people, deals, and opportunities at the right time so that it can all happen. It’s worked so far, right? I’ll include this photo just because it’s too cool not to. 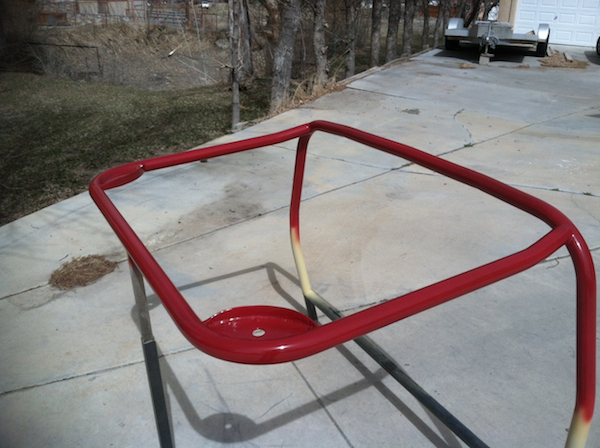 This is the new main hoop and halo bar of the roll cage, painted ’64 Chevelle interior color red. The little custom pockets in the halo bars are a place to mount the sun visors! 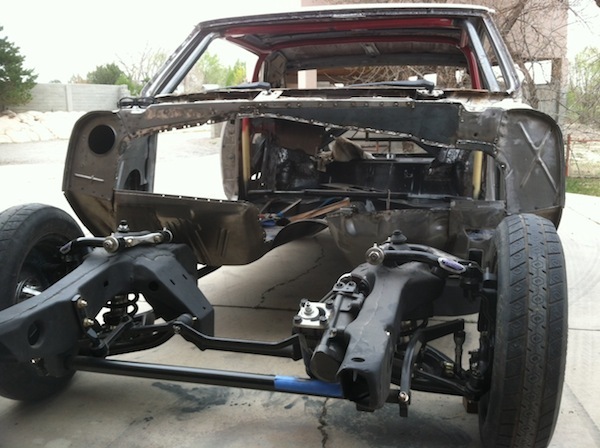 See all PREVIOUS posts of the Chevelle Build!